Back in my undergraduate student days the only cookbook I owned was Alison Holst’s “Meals without Meat”. I can confidently say that between 1993 and around 2005 I tried at least 50% of the recipes in that book, spurred on by a lengthy period of vegetarianism, and Alison’s inherent trustworthiness (she could easily be your very own Mum, passing on tried and true family recipes). Although it’s not a book I have used much in the past few years, it remains a stained, spattered and well-loved possession. It’s currently packed away in our storage unit back in Auckland; even so, I can effortlessly conjure the double-page photographic spread that accompanies Alison’s recipe for hummus. 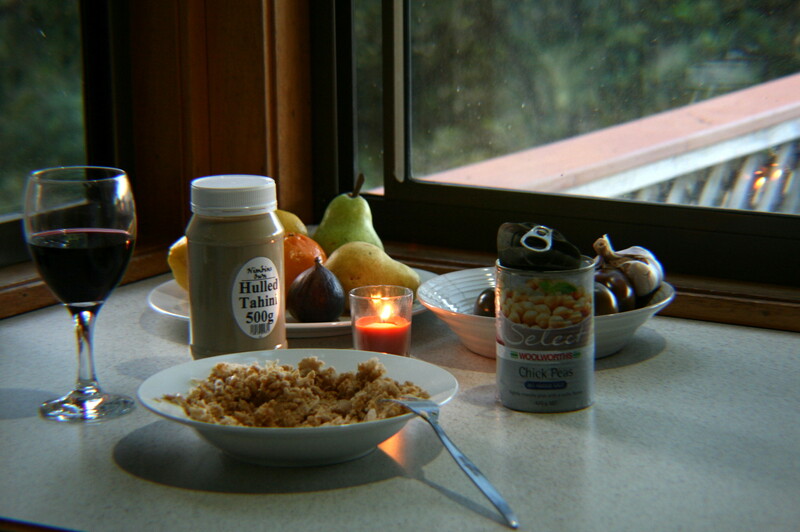 Alison’s recipe calls for home-cooked chickpeas, probably because the book was published at a time when canned chickpeas were not readily available in NZ. The one and only time I attempted to make it, I sought out the unfamiliar tahini and tracked down a bag of dried chickpeas, which I proceeded to cook for hours. After assembling the hummus (the recipe produced a voluminous amount), I found the resulting mixture to be totally inedible, probably because I had undercooked the chickpeas. Alison had claimed that hummus was “addictive”, however, on this rare occasion Alison failed me, and it was some time before I sampled hummus again. Pre-made varieties of hummus later turned me on to those promised addictive qualities. 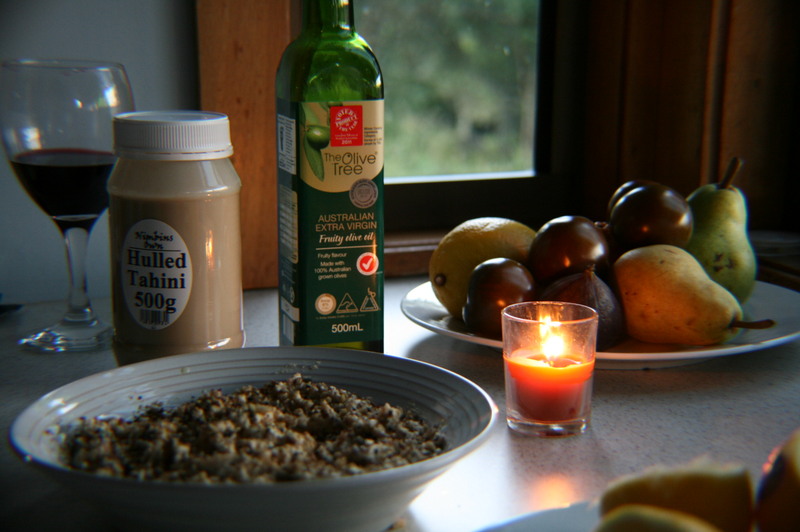 The ubiquitous New Zealand-made Lisa’s brand was a staple item on my shopping list for years until I discovered how easy it is to make and how much more I loved my own homemade variety, in which the zing of lemon, sharpness of garlic and earthiness of tahini are that much more intense. It doesn’t seem right to provide a recipe as it’s such a simple process, but it starts by blending or mashing a can of drained, rinsed chickpeas with crushed garlic, the juice of a lemon, a couple of tablespoons of tahini, and a good pinch of salt, then tasting-adding-tasting-adjusting until it’s just right. I often thin the mixture with a little water, and lately I serve it in a wide dish sprinkled liberally with dukkah for an extra-moreish hit. My love for homemade hummus has been the only reason why I always had tahini lurking somewhere in the fridge – until recently. 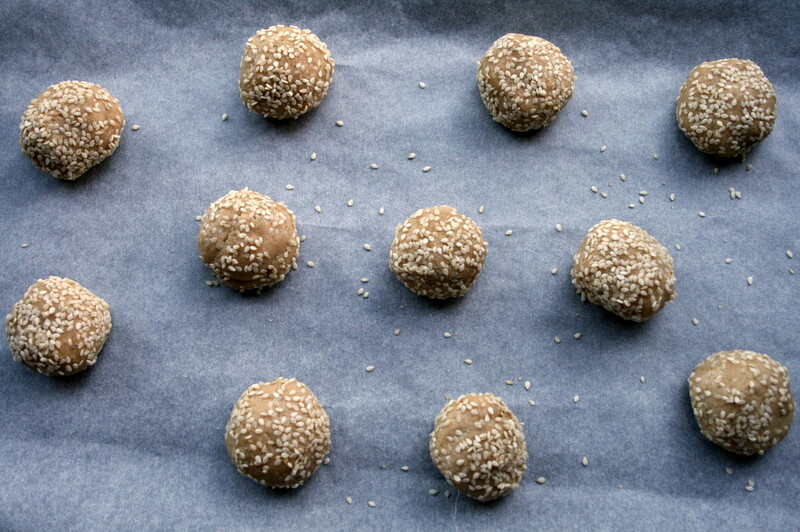 A few weeks ago, I came across a novel and intriguing recipe for Tahini Cookies on a blog I have recently discovered. I decided to trial these cookies, and made them to take to a meeting at work. As soon as I ate one I knew they were wonderful, and the favourable responses of my work-mates confirmed their deliciousness. I’ve included the link here and encourage you, implore you, to make them. Due to the success of the Tahini Cookies, I felt motivated to search for further new ways to use tahini. Recipes for tahini dressing abound on the Internet, and this lemony one is great (and I don’t think that the suggested guar gum is necessary). 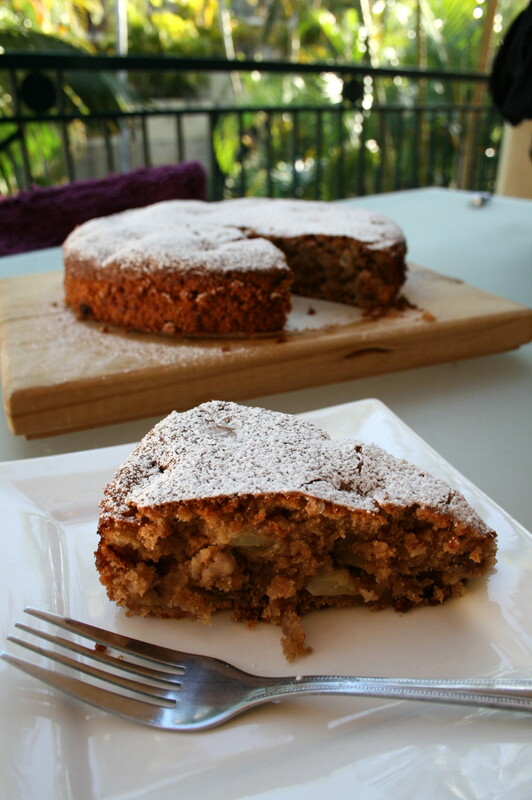 I was also intrigued by a recipe for Greek Apple Tahini Cake which I tried last weekend (recipe below). Much like the cookies, this cake boasts a lovely richness from the tahini, but this time the flavour is less pronounced, mellowed by the addition of fresh apple and cinnamon. The cake doesn’t quite have the lift of more conventional recipes, but it is beautifully moist, and as it happens to be vegan, it would be a useful recipe for those who need to avoid eggs and/or dairy. If you needed any further encouragement to try some tahini recipes, it might be helpful to know that tahini is extremely nutritious. It’s even higher in calcium than dairy products, as well as being high in B vitamins, copper, protein and unsaturated fats. I’m certainly going to be using more of it in future. I’ve made a few changes to Sara’s recipe, mainly swapping brandy for Cointreau/vanilla essence and changing the method, as the tahini-sugar mixture siezed when I made it as specified. The cake was nice but not amazing on the first day. On the second day it was denser and moister and the flavour was greatly improved. By the third day it was getting a little too moist for my liking. Lesson: if you can wait, leave it to the second day, and then devour it all. Preheat oven to 180°C/350°F. Line a 22cm spring form cake tin with baking paper. Grease the tin with butter or cooking spray (if you want to be totally vegan), and sprinkle lightly with flour. Using a cake mixer, beat the tahini, slowly adding the sugar a couple of tablespoons at a time. In a separate bowl, toss together the flour, baking soda, cinnamon, walnuts and diced apple. In another small bowl, mix the orange juice, Cointreau and vanilla essence. Add one-third of the flour/nut mix to the tahini and fold through. Add 1/2 the orange juice mixture and stir until incorporated. Add another third of the flour, then the other half of the orange juice. Finish with the remaining flour and mix just until combined. The batter will be thick, smooth, and a beautiful caramel colour. Pour the batter into the tin and place in the oven. Sara advises baking the cake for 45 minutes, but I needed to cook mine for closer to 70 minutes. I would advise testing it with a skewer at the 45 minute point, and every 5 minutes after that until it is done. Remove from the oven and let the cake cool in the tin. Run a knife around the edges, then remove from the tin and dust with icing sugar. Impressive as always Chez!!! Not sure where you get all the time!! Will have to get you over and full my baking tins!!!! Luv 2 u both.